Entrepreneur, accused of swindling millions from investors, has receipts for meals and massages Shurtleff and Swallow charged to him. 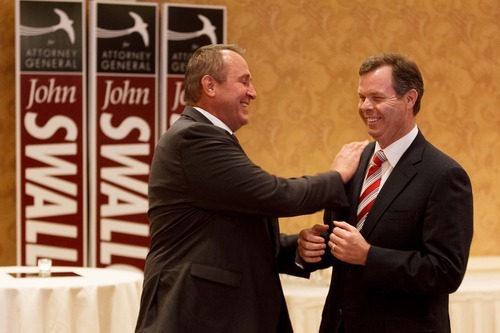 Marc Sessions Jenson headed to prison Trent Nelson | Tribune file photo Utah Attorney General Mark Shurtleff, left, and Republican attorney general nominee John Swallow share a laugh at a campaign event. Draper • Receipts show then-Utah Attorney General Mark Shurtleff and his successor, John Swallow, got free meals, massages, golf outings and supplies at a gated Newport Beach villa, charging thousands of dollars of expenses to a man the Attorney General&apos;s Office had months earlier charged with six felonies and has put behind bars. Shurtleff&apos;s and Swallow&apos;s curious and complicated relationship with businessman Marc Sessions Jenson, accused of swindling millions from investors, is part of an ongoing federal probe into Swallow&apos;s conduct that appears to now include Shurtleff as well. "I&apos;m telling you right now: They were extorting me, and they were from the very beginning," Jenson said in an interview Wednesday at the Utah State Prison in Draper. Jenson, locked up after failing to pay $4 million in restitution and facing a new set of fraud charges, has met twice with the FBI and provided them with the same receipts and documents his attorneys gave to The Salt Lake Tribune. The Southern California vacations were just part of what Jenson says Shurtleff and Swallow pressed him to provide. In addition, Jenson says, Shurtleff directed him to make consulting payments to a close friend of the attorney general and asked him to spend $250,000 on a phantom book deal. Jenson says that Swallow, who boasted in 2009 that he would be joining the Attorney General&apos;s Office as Shurtleff&apos;s handpicked successor, suggested he could help the businessman navigate his legal troubles from inside the office and ensure that Jenson&apos;s plans for a luxurious $3.5 billion Mount Holly resort, with private ski slopes and a Jack Nicklaus-designed golf course, became a reality. In exchange, Jenson alleges, Swallow wanted a share in the posh Beaver County resort. The shares started at $1.5 million. "I was stunned. I was shocked. I was also scared to death," Jenson said. "I had no idea what they would do next." Swallow&apos;s spokesman, Paul Murphy, issued a statement late Wednesday. Murphy says Swallow met Jenson when coaching Jenson&apos;s nephew in little league baseball, and all of Swallow&apos;s interaction with Jenson occurred when he was an attorney in private practice, before joining the Attorney General&apos;s Office. "He never promised to help Mr. Jenson if he breached his plea arrangement," the statement said. Swallow has walled himself off from any involvement in Jenson&apos;s case since June 2011 and the office has aggressively prosecuted Jenson, the statement said. Shurtleff flatly denies Jenson&apos;s allegations, alleging the convict is retaliating against the man who put him in prison. "I was responsible for the investigation, conviction and sentencing of Jenson," Shurtleff said. " … He has sworn revenge. I suggest you consider carefully whether to believe a desperate, convicted fraudster." Jenson&apos;s story goes back more than a decade and is marked by several multimillion-dollar ventures that fizzled. A California native who grew up in Holladay, Jenson amassed considerable wealth making short-term, high-interest "bridge loans" to business ventures while they were trying to get long-term financing. He had experienced legal tussles before, including two bankruptcies and a previous prison stint on a tax conviction. In 2005, the risky business deals caught up with him. A bid to buy the Mongoose bike company fell through and angry investors  whom Jenson insists he repaid in full  accused Jenson of deceiving them about the deal and his past, prompting the Utah Attorney General&apos;s Office to charge Jenson with five counts of securities fraud and a count of racketeering. Jenson says he was at a Jazz game in 2008, when he was approached by Rob Stahura, a longtime friend. Stahura ran Mentoring of America, which itself came into the cross hairs of state regulators and ultimately was sued by the Federal Trade Commission. Stahura had raised tens of thousands of dollars for Shurtleff and, Jenson says, offered to contact the attorney general on Jenson&apos;s behalf. Stahura arranged a meeting with Shurtleff and also introduced Jenson to Tim Lawson, a Shurtleff friend and a self-described "fixer." Jenson says Lawson became his conduit to Shurtleff and that he paid Lawson significant sums, starting with a down payment on a piano, then $10,000 in cash followed by periodic payments during the next 18 months. Jenson says Shurtleff told him to make the payments and "personally told me, &apos;Tim&apos;s my guy.&apos; " Jenson believes some of the money went to Shurtleff. Lawson says Jenson&apos;s claims are absurd. He says Jenson hired him to keep investors at bay while he scraped together money to repay them, but maintains Lawson never provided Jenson access to Shurtleff. "Jenson is in prison because he is a pathological liar," Lawson said, "because he lied to the people he stole money from." Later, Jenson says, Stahura also brought in Swallow  then Shurtleff&apos;s lead fundraiser and still more than a year from becoming No. 2 at the Attorney General&apos;s Office  to be another line to Shurtleff. In May 2008, Jenson&apos;s attorneys hammered out a plea in abeyance with prosecutors from the Attorney General&apos;s Office in which Jenson would pay no restitution and serve no time  as long as he stayed out of trouble. But 3rd District Judge Robin Reese rejected the deal as too lenient. Later that month, the parties were back in front of Reese, who approved a plea in abeyance that would lead to Jenson&apos;s release, but require him to pay $4.1 million in restitution over three years. Soon after the plea, Jenson says,Lawson and Shurtleff began pressing him to help Shurtleff make campaign-fundraising connections. In 2009, Shurtleff and Swallow made their first trips to the tony Newport Beach community of Pelican Hill. Jenson says Shurtleff went twice in 2009, once for a weekend, the next time for several days longer. Swallow made three visits. Receipts show they played rounds of golf. Swallow and his wife received $228 stone massages. Swallow picked up golf balls, gloves, a golf hat and an argyle sweater totaling more than $400. And the guests ordered meals worth hundreds of dollars  all of it on Jenson&apos;s dime. Jenson says he had little choice. "Can you imagine how I actually felt about these people after all I&apos;d been through?" Jenson asked. "Yes, I was cordial, but I thought this was just crazy." Lawson and his family were also frequent guests. Lawson says he visited Pelican Hill twice a month over several months. He says Shurtleff and Swallow were his guests at the resort and that their expenses were part of his compensation. "Part of the perks of me working for Jenson meant I got access to the facilities and meals and that stuff paid for," Lawson said. "That had nothing to do with Shurtleff. That just happened to be one of my perks." Jenson says Shurtleff told him repeatedly that if the businessman had given to his campaign, he could have avoided all of his troubles. "Mark Shurtleff told me at least 50 times, &apos;If you&apos;d just donated to my campaign, if I&apos;d known who you were, this never would have happened," Jenson said. Shurtleff says no such conversations happened. "That&apos;s laughable. Categorically false," he said. "Not even a hint or a suggestion. There are scores of people who will tell you Marc Jenson is a pathological liar." Jenson also claims that Shurtleff approached him with another deal he rejected. He says after Shurtleff&apos;s book, Am I Not A Man?, a historical narrative of the 19th-century slave Dred Scott  which Shurtleff wrote chunks of during his time at Pelican Hill  was published, Shurtleff suggested that Jenson buy $250,000 worth of books. Jenson says Shurtleff would get $50,000 to $60,000 of that money and that Jenson would never have to actually receive the books. Again, Shurtleff denies it happened. "Everything he told you are lies," Shurtleff said in an email. Jenson made his allegations wearing a white prison jumpsuit, sopping up a lunch of sloppy Joe-like stew with white bread. He said he could trade his cookies for a stamped envelope to send a letter home. After Jenson failed to pay any of his restitution  despite, prosecutors say, burning through more than $9 million while living his lavish lifestyle  Reese sent him back to prison in 2011 for up to 10 years. 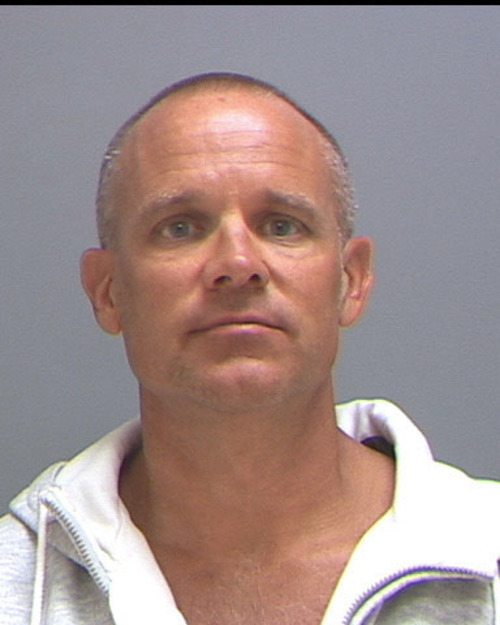 The Attorney General&apos;s Office also hit Jenson and his brother, Stephen Jenson, in August 2011 with another set of eight second-degree felony charges for allegedly defrauding investors out of millions in the Mount Holly project. That case is still pending. Jenson says he has met twice with FBI agents for about seven hours and believes the investigation is broader than people realize. "It is my firm knowledge," he said, "that these two [Shurtleff and Swallow] are the tip of the iceberg that [the feds] are interested in." Who else are they after? He wouldn&apos;t say. Indicted St. George businessman Jeremy Johnson, who faces 86 criminal counts, has alleged that Utah Attorney General John Swallow helped broker payoffs to enlist the aid of Senate Majority Leader Harry Reid in derailing a Federal Trade Commission investigation of Johnson&apos;s I Works business. Swallow and Reid have denied the allegations. The Justice Department is investigating.